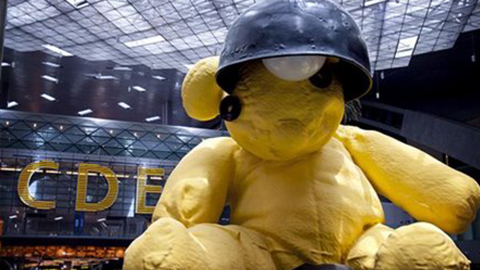 Lamp Bear by Swiss artist Urs Fischer takes centre stage in the grand foyer leading to HIA's world-class duty-free hall. It is a 23-foot canary yellow teddy bear sculpted from bronze, that sits peacefully inside a lamp. It's a playful piece that humanises the space around it and reminds travellers of childhood or precious objects from home. In Lamp Bear, Swiss artist Urs Fischer combines memory with scale, creating simultaneously a monument and a vision. Scale defines our experience with art and particularly with sculpture. Scale doesn't necessarily mean smaller or bigger. It means placing the viewer in a different relation to the reality he or she is familiar with. Memory is not just the past but a way to reimagine our lives. 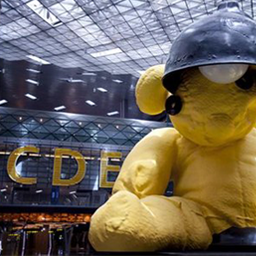 Lamp Bear welcomes guests at Doha's airport and celebrates the idea of travel, just as the artist celebrates travelling back in time to the symbols of childhood - a place we have all been to and where, once in a while, we like to go back. The yellow bear and its lamp are both playful and impressive: The coming of age of a simple toy into a full grown artwork. The iconic piece is located at the South Node of the terminal, just after departures security and passport control.